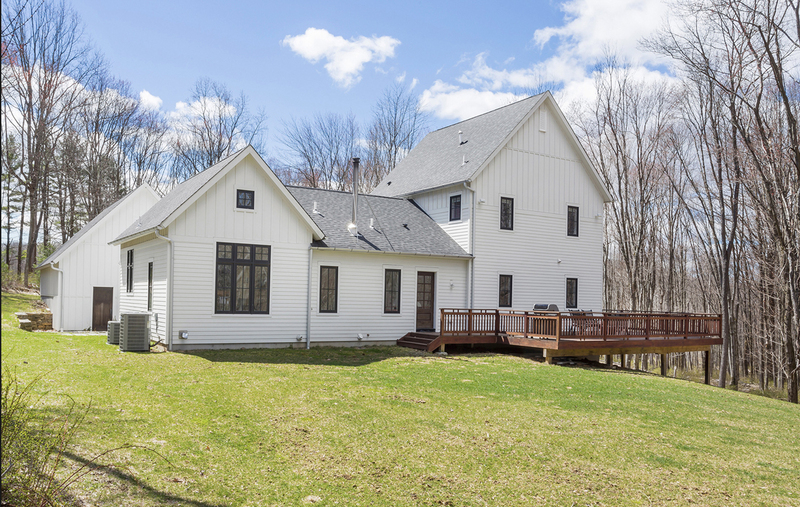 This exceptional 4 bedroom, 3 bathroom farmhouse style custom home was built in 2015 by the architect owner with a focus on efficiency. Oriented to maximize appreciation of its bucolic natural setting from inside and out, this property is perfect for a buyer looking for a high-quality and architecturally distinctive home. The floor plan of the home has open lines of sight in gathering and entertaining areas. 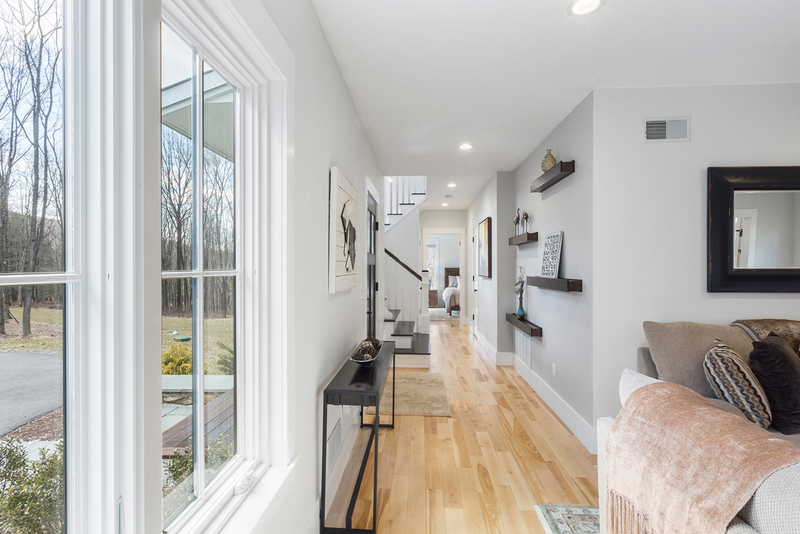 A motif of a modern interpretation of traditional two-over-two windows provides plentiful natural light throughout the day and allows visual connections between the interior spaces of the home and its natural, sylvan setting from every room. 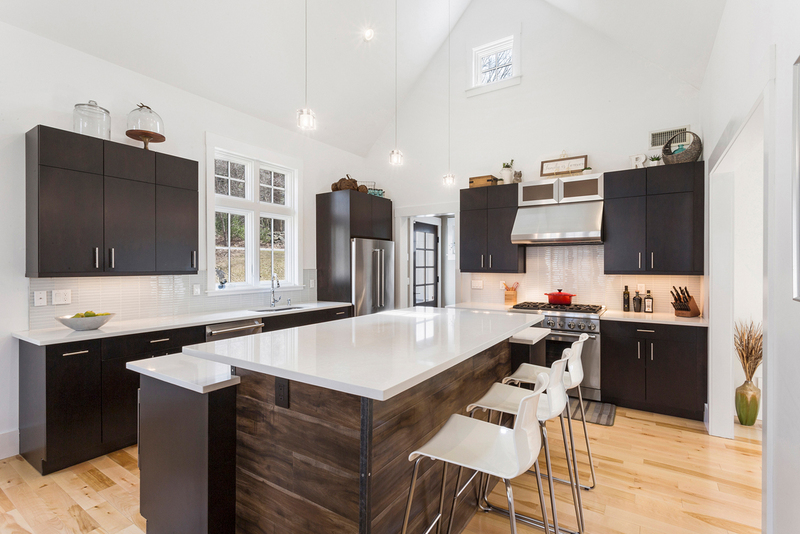 Solid 4-inch wide Norwegian birch floors throughout the home, wooden kitchen cabinetry, oiled-bronze door hardware, and a wood-burning stove underscore the home’s rustic farmhouse styling which is blended with modern conveniences for a look that is elegant in its simplicity. After driving up a meandering paved driveway starting with crossing over a babbling brook through the woods, visitors are welcomed to the home by way of a bluestone and white crushed marble walkway that leads to a mahogany covered porch detail accenting the mahogany front door. Entering the home, visitors are immediately welcomed into the heart of the home — a central room for gatherings with open lines of sight into the large eat-in kitchen. 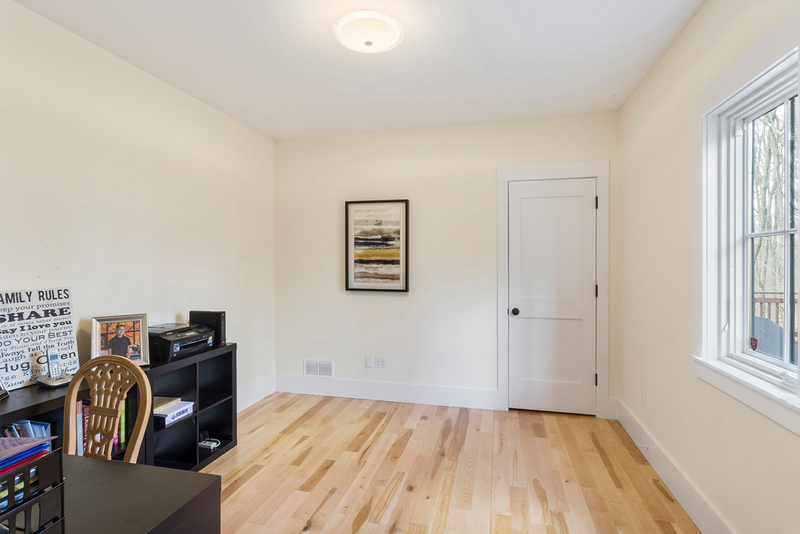 The highlight of this space is a centrally located Quadra-Fire wood burning stove. 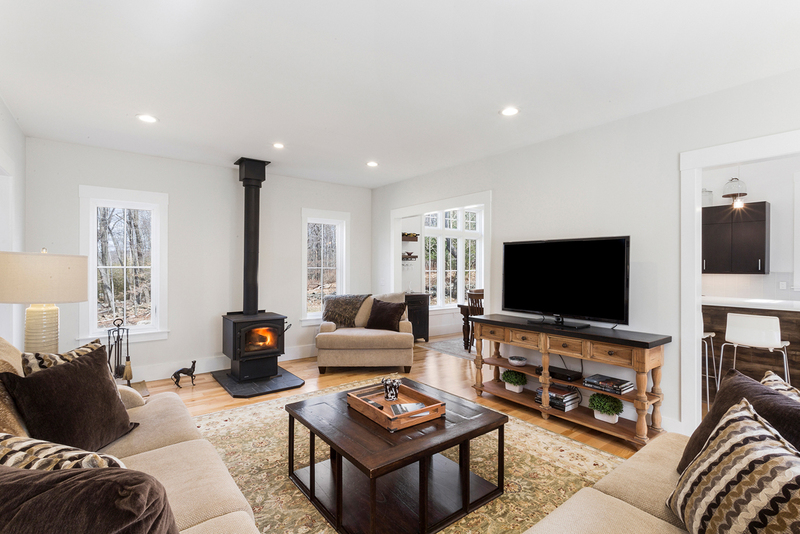 The wood stove on a black slate hearth which not only has aesthetic value but is also practical as it radiates warmth through the house to act as a great supplemental heat source reducing heating costs to a minimum. 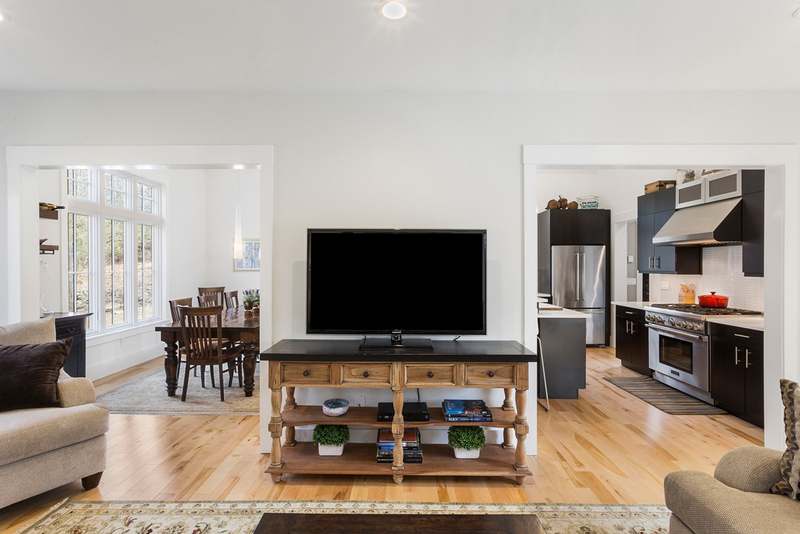 The modern farmhouse theme is most evident in the home’s kitchen with its peaked ceilings (a departure from the first floor’s 9 foot ceilings) and transom and high accent window giving the space a sense of lightness to a traditional architectural style. Expansive white Quartzite countertops on the center island and perimeter counters have generous space for cooking without sacrificing space for gathering with a spacious breakfast bar. Other finishes include wood cabinetry above and below the counters with stainless steel pulls, pale grey rectangular glass tile backsplashes, deep rectangular stainless steel undermount sink with polished nickel gooseneck faucet, and glass pendant accent lighting above the counter and dining area. 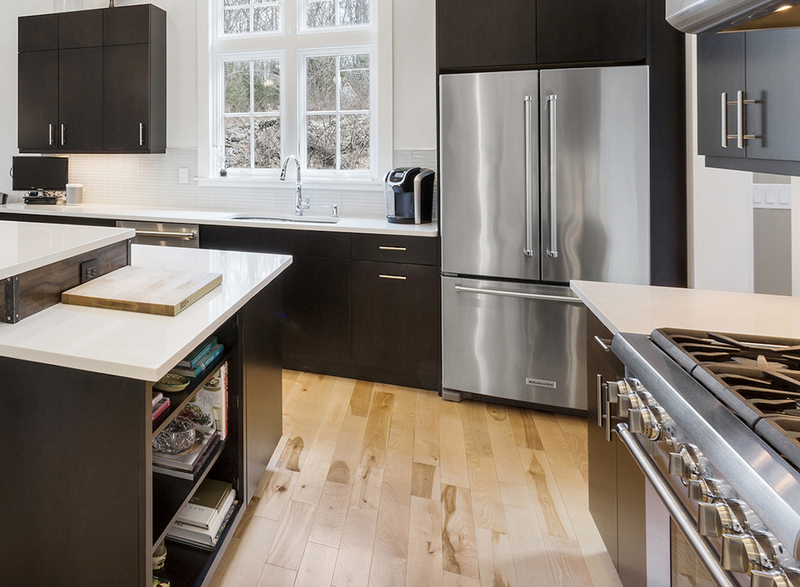 Appliances include a Thermador stainless steel 6-burner gas range with gas oven, high-velocity stainless steel ventilation hood, stainless steel French door KitchenAid refrigerator, stainless steel Thermador dishwasher, and stainless steel GE under counter microwave oven. A large dining area with its soaring windows and open to the kitchen is adjacent to the living room. With its generous dimensions, it currently accommodates an oversized farm table and additional furniture. 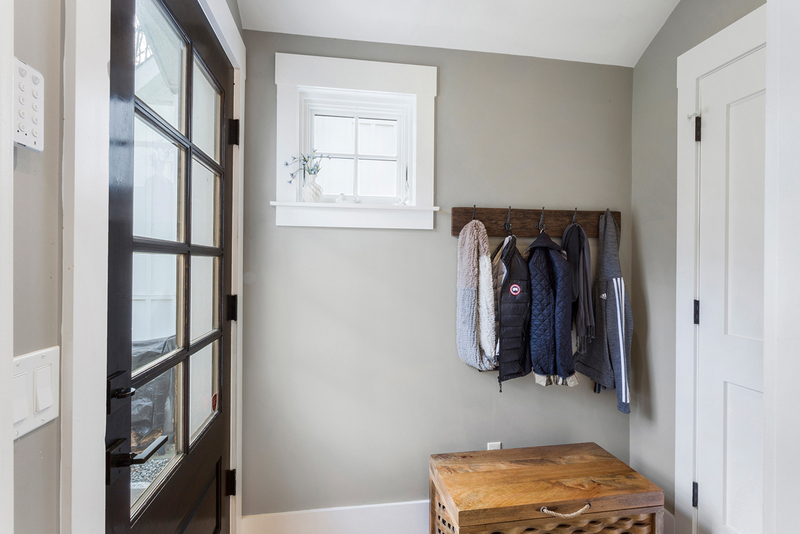 Adjacent to the kitchen, a mudroom with a closet that can be used for coats or as a pantry, leads to the backyard and detached garage, creating a short, direct path from the garage to the pantry area. 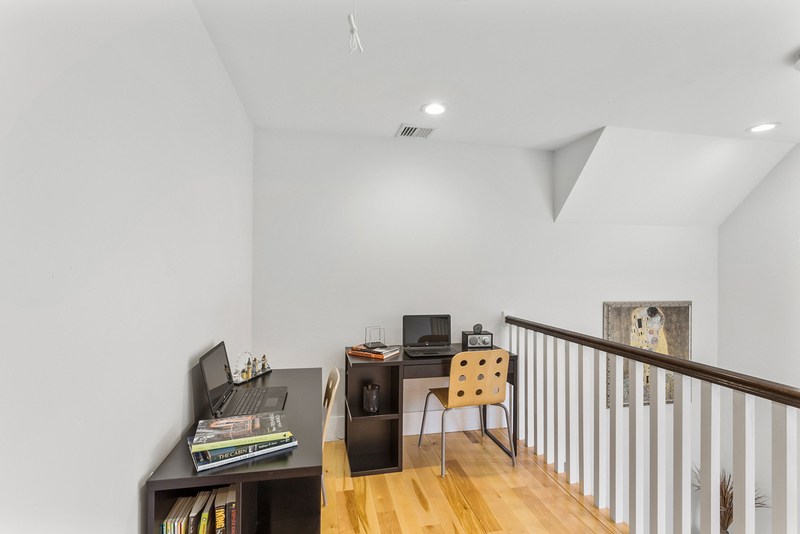 Architectural drawings are available showing how this space can be modified into an enclosed transition space leading to the garage. 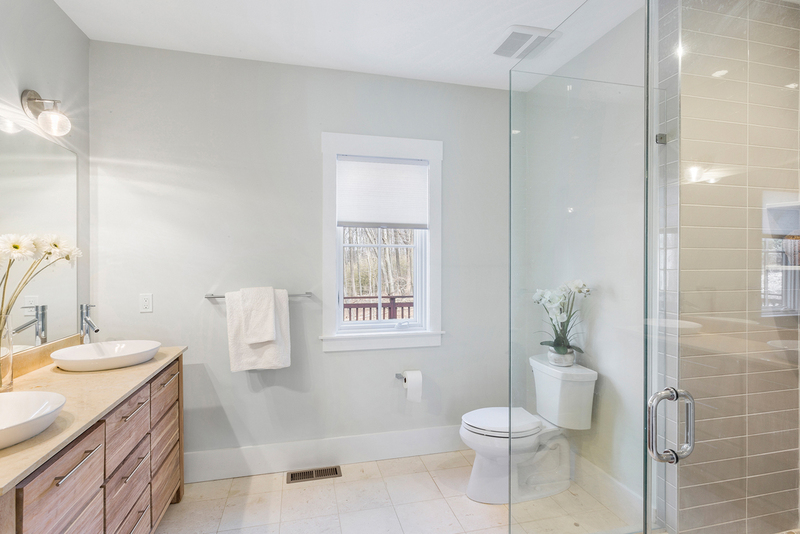 A small hallway on the first floor features a closet and leads to access to the wood deck and a large full bathroom with wood vanity and glass-enclosed shower with nickel fixtures. 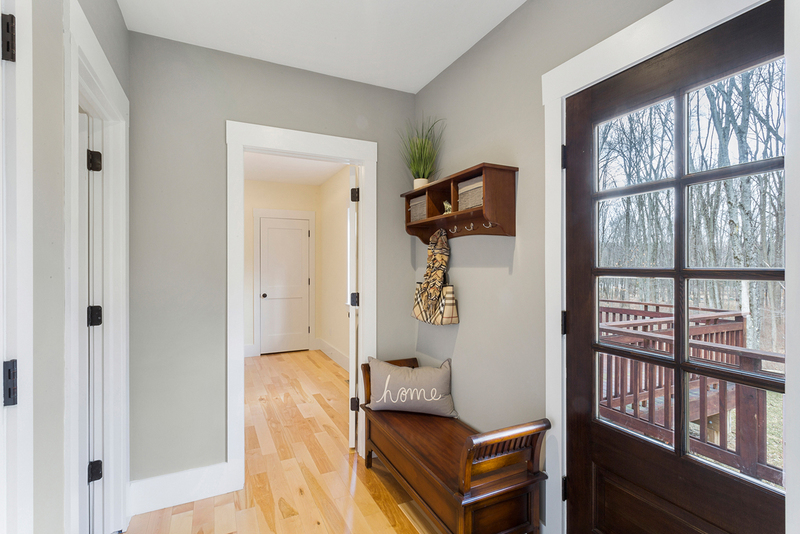 This hallway also leads to the fourth bedroom of the home which makes this room perfect for use by guests, in-laws, or an au pair. 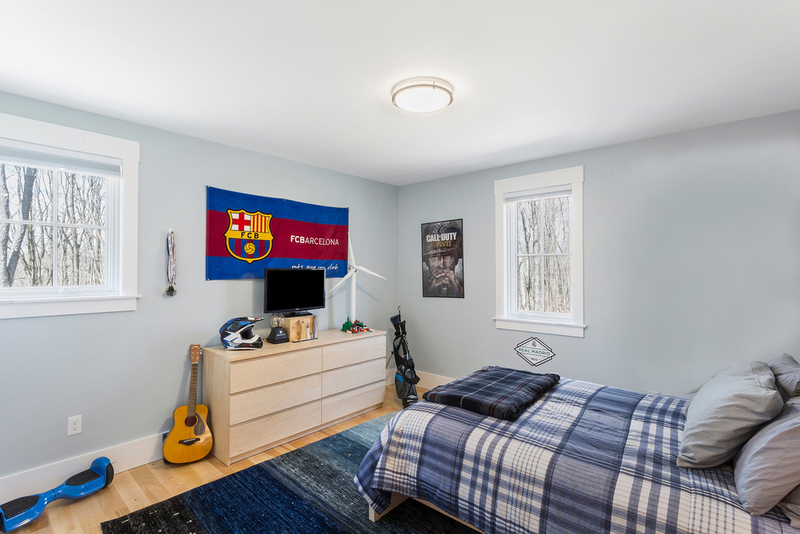 The bedrooms of the house are on the opposite side of the house from the entertaining areas on both the first and second floors — an arrangement reflecting recent trends for evolving living arrangements with single or multiple generations in one household. 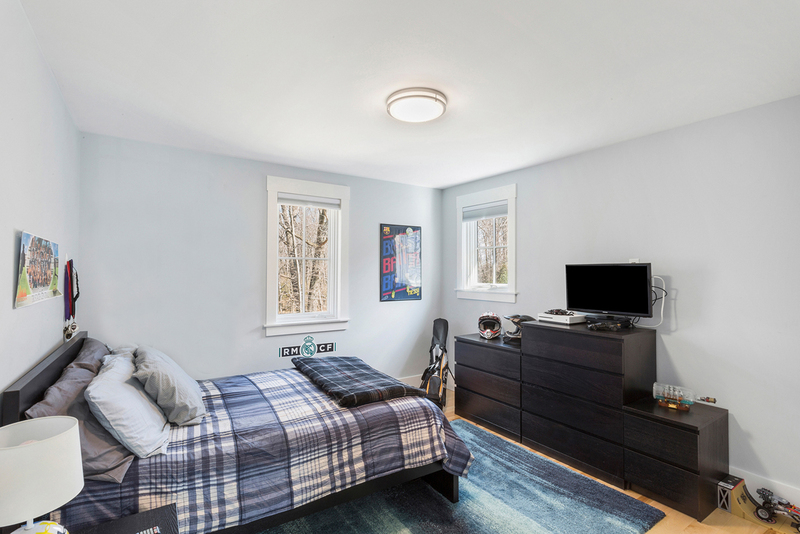 The master bedroom suite is on the first floor at the end of the main corridor of the house and includes oversized windows, a large walk-in closet built out with shelving, drawers, and areas for hanging clothes, as well as a well-appointed master bathroom. The master bathroom has a large teak vanity with plentiful storage and topped with a polished marble stone counter topped with two white porcelain bowl sinks each with a polished nickel faucet, a large rimless-glass-enclosed shower with rectangular glass tiles, river stone tile floor, and polished nickel faucet set with removable sprayer head. 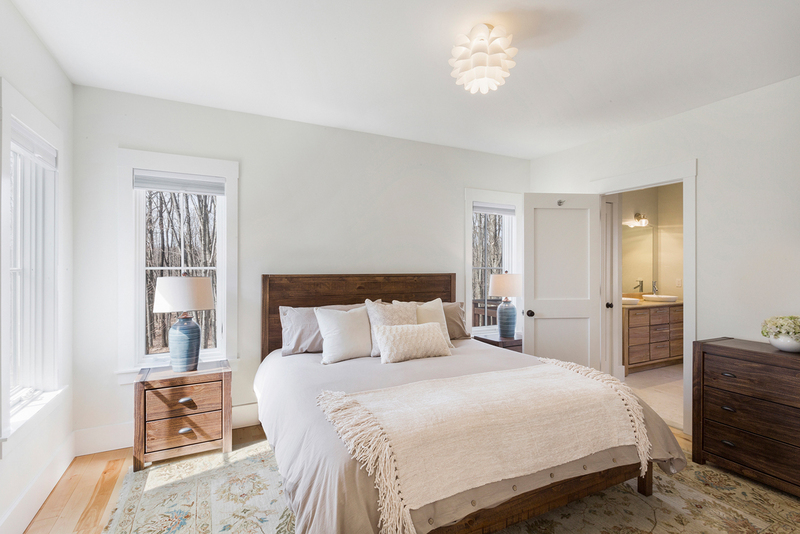 Two additional bedrooms are above the master suite on the second floor. 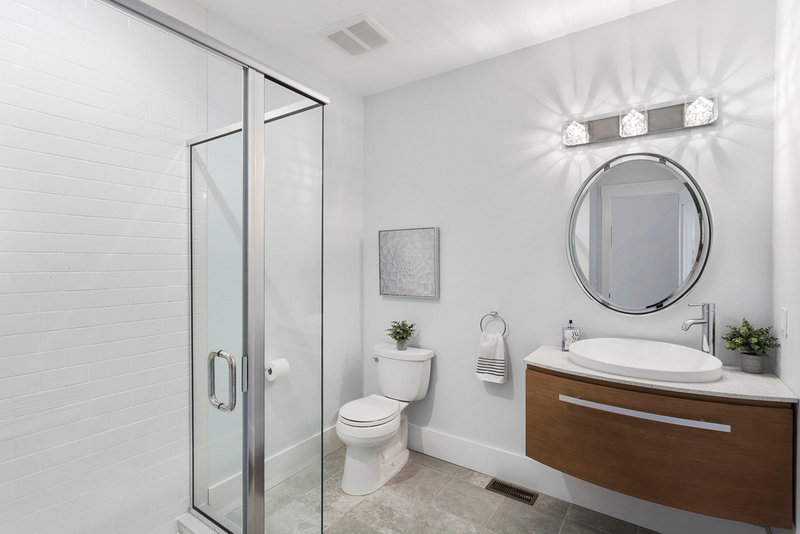 These rooms feature double reach-in closets and share a loft/reading area at the top of the stairs and large bathroom with tiled tubshower and two separate cherry vanities with rough-honed granite counters, porcelain bowl sinks, and polished nickel faucets. 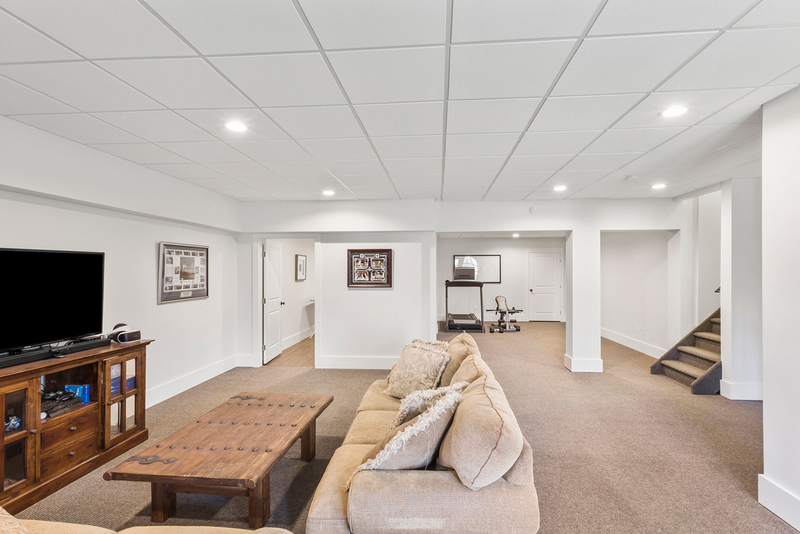 With its 9-foot ceilings and double doors to the yard, the home’s full, finished basement provides a significant addition to the total living space of the home. The space is currently configured with two primary areas finished with a durable wall-to-wall carpeting, including a welcoming recreation room and a workout room. 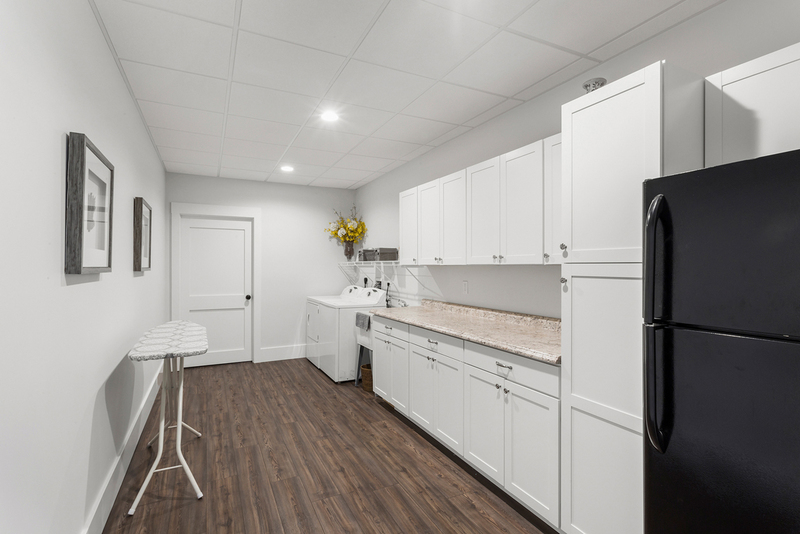 The home’s generously-sized laundry room with a sink, cabinets, and plenty of counterspace was designed in response to the omnipresent need for just a bit more space in a laundry room. Unfinished basement space revealing the home’s 10 foot high pre-cast concrete insulated foundation walls can be accessed from the laundry room and workout area of the basement providing plentiful space for storage. 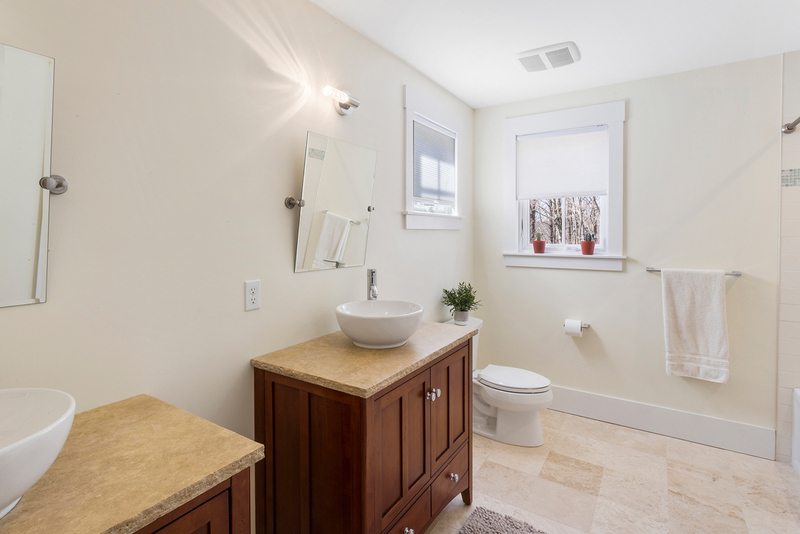 This area also serves as a utility room and has plumbing for installation of a full bathroom. Systems of the home include two high-efficiency (one modulating, one 2-stage) propane gas-fired furnaces delivering forced hot air throughout the home, high SEER rated central air conditioning, on-demand hot water heater, 200 amp electrical service, 4-bedroom gravity-fed septic system, high volume (25 gallons/minute) well, generator hookup, passive radon system, alarm system, smoke detectors, carbon monoxide detectors, and fire extinguishers. The exterior walls of the home are built with 2×6 construction sided with cement board traditional lap blended expertly with board and batten configuration. 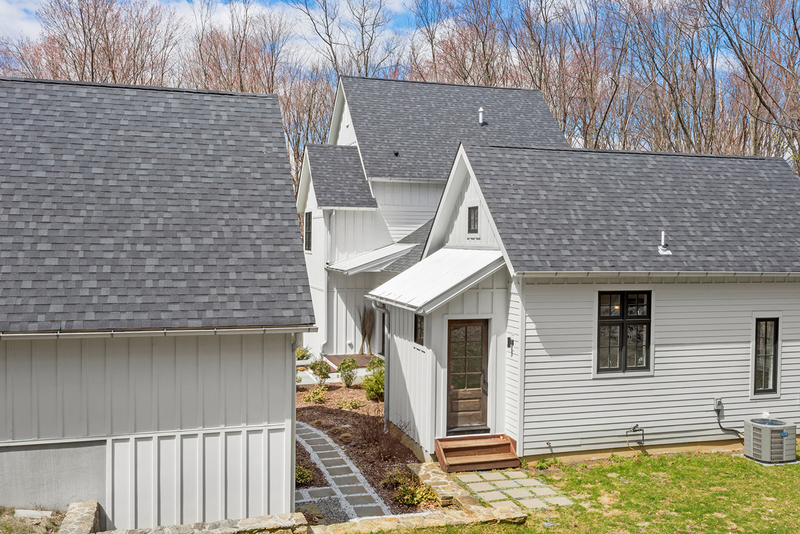 The primary roof of the home is charcoal asphalt architectural shingle and smaller roof details are accented with metal roofing. 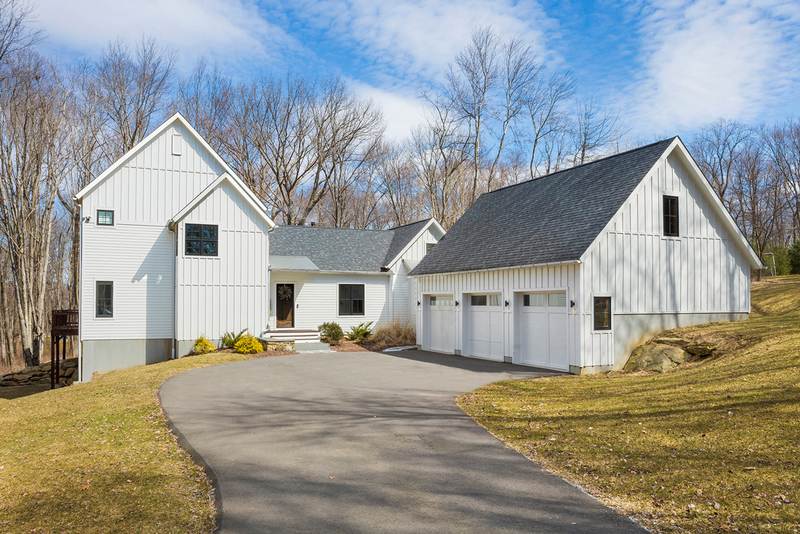 Half-round metal gutters on the house and garage underscore the modern farmhouse aesthetic. A wood deck overlooks wooded vistas and can be accessed from both the house and the yard. 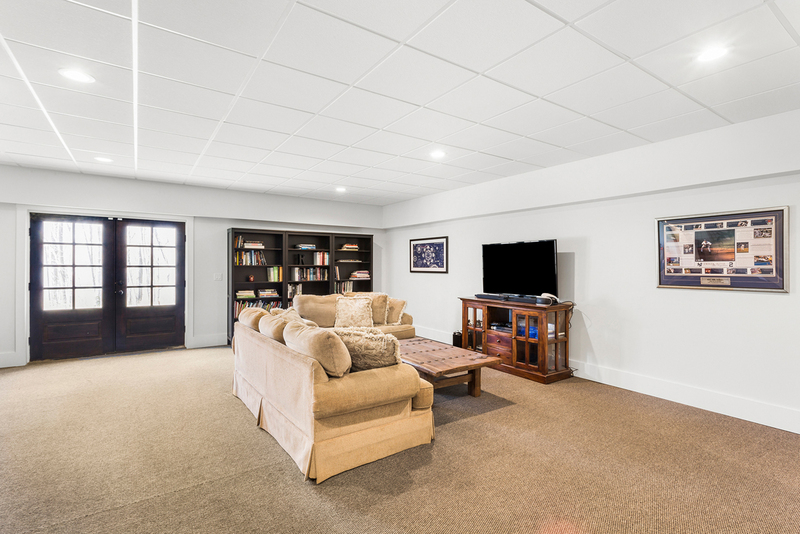 The oversized, detached, 3-car garage has a 10-½ foot high lower level that has an open span, with garage door openers for each door. 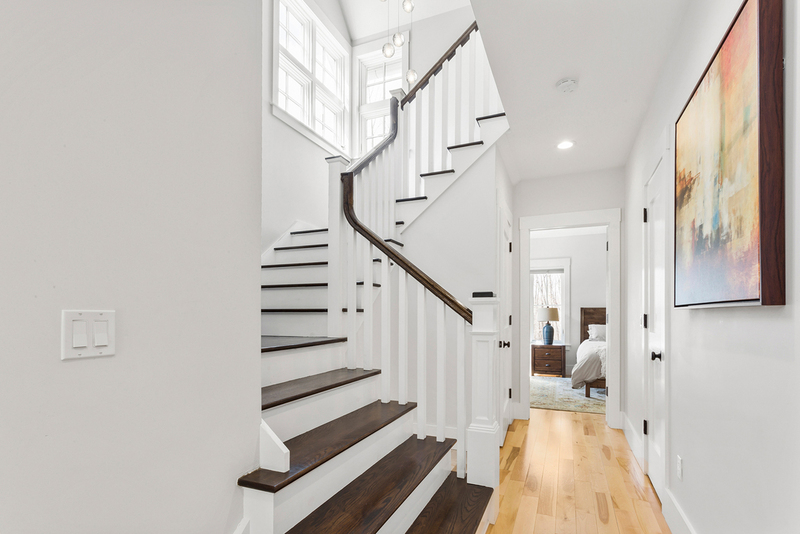 A turned staircase leads to an upper level of 800 square feet of storage space that could be used as a workshop or studio. Hardscaped bluestone paver walkways are accented by white crushed marble and perennial beds unite the structures and beyond the immediate vicinity of the home there are multiple possibilities for recreational enjoyment of the property over its 13. 59 acres. The property is located in Tewksbury Township nestled on a scenic country road between the historic villages of Mountainville and Califon. Tewksbury is one of the most prestigious areas of Hunterdon County and renowned for its natural beauty, private estates and upscale lifestyle, marked by the popularity of equestrian sports related to the nearby Essex Hunt Club, United States Equestrian Team and United States Equestrian Foundation, miles of scenic riding trails in the Tewksbury Trail System. Nearby outdoor recreation areas include Christie Hoffman Farm Park, Ken Lockwood Gorge, the Columbia Trail, and Round Valley Reservoir. It is served by Tewksbury Elementary School (designated a Blue Ribbon School in 2011), Old Turnpike Middle School, and Voorhees High School (designated a Blue Ribbon School in 2015) and is convenient to private schools (The Willow School, Gill St. Bernard, Pingry, Far Hills Country Day) with nearby shopping, golf courses and country clubs (Hamilton Farm, Fiddler’s Elbow, Trump National). Commuter highways (Interstates 78 and 287), TransBridge Line buses and NJ Transit trains allow for convenient access to New York City and Newark Liberty International Airport as well as smaller regional airports. A gem like this doesn’t come along often. Kelly founded Leaf, Realtors® in 2011 after 12 years of experience in residential real estate in the Hunterdon/Somerset/Morris county area. Originally licensed in New Jersey as a salesperson in 1999, Kelly has been licensed as a broker since 2003 and was first licensed as a real estate instructor in 2004. Kelly went above and beyond to make us feel at home, introducing us to local services and great people. Needless to say we were very happy and still in love with the place and neighborhood to this day. Kelly represented me on the buy side of complex transaction. She and her team did an outstanding job keeping the deal on track and moving toward a successful conclusion. Kelly is an intelligent, motivated and charming realtor. She knows how to best utilize digital media and understands her market at the highest level.